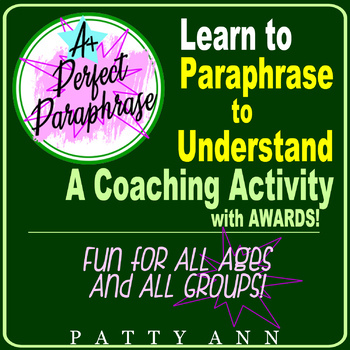 Oral Communication Language Activities: Learn to Paraphrase 2 Understand ~FUN! Oral Communication 4-Pack BUNDLE *Guidance *Activities *Engaging Training Games! ORAL CoMmUnIcAtiOn, WRITTEN & LANGUAGE Arts Skills Perpetual Curricula Bundle! * No more confusing language barriers! * Learn how to straight talk and clarify statements easily. * Get results NOW using this simple game. * Suitable for all environments: school, work, home- anywhere people talk. * Teachers, students, employees, supervisors, peers > EVERYONE benefits! * Implement and augment your work place or classroom. * Award buttons acknowledge successful interactions. * Includes instructions, poster, and copy/cut out award buttons. $AVE >> The Paraphrase 2 Understand Learning Activity is also included in The COMMUNICATION CONNECTION 4 PACK SET. Get BIG BUNDLED $AVING$ NOW! Purchase the COMPLETE CoMmUnicAtiOn Package = INCLUDES EVERY Oral & Written Patty Ann Product!